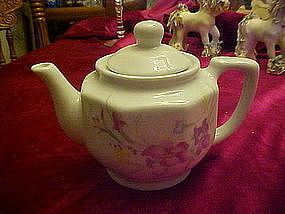 Cute little teapot will be just perfect for a couple cups of tea. Made of heavy china and measures about 5 1/4" tall. Pretty pastel flower decoration on one side. Perfect condition. No makers mark.